History has an awkward relationship with the wider academic field of European studies. While analyses of the current European predicament are replete with references to the past, history as a discipline is somewhat marginalised in the academic and media environment of 2015. Whenever a debate is organised on the current state of European integration, political scientists and economists lead the discussions, while historians stand out by their deafening silence. Is there someone to blame for this sorry state of affairs, and if yes who? The following pages argue that while historians can surely be criticised for having marginalised themselves on regular occasions, the last decade has brought about significant changes. In particular, the emergence of a rich and vivid historiography leaves no excuse to colleagues from other disciplines for not engaging with historians’ work of immediate intellectual relevance to their field of inquiry. This historiography is an integral part of the field of EU studies, a vast and complex research field over which no single discipline ought to claim, whether implicitly or explicitly, to have a monopoly. 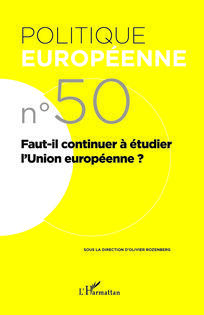 Published in Politique Européenne, n°50, 2015, pp.56-69.